It's no secret that I adore stylish and remarkable nonagenarian, Iris Apfel. Not only do I worship her personal style of total maximalism, I couldn't agree more with her perfectly coined witticisms on accessorizing, growing older, and life in general. Iris's new book, Iris Apfel - accidental icon. Musings of a Geriatric Starlet is packed with fun facts, color, and amazing photos of her remarkable life and outfits through the years. Publishing this book at 96, Iris's many musings are a timeless tribute to her confident,exuberant, eclectic and gutsy style. 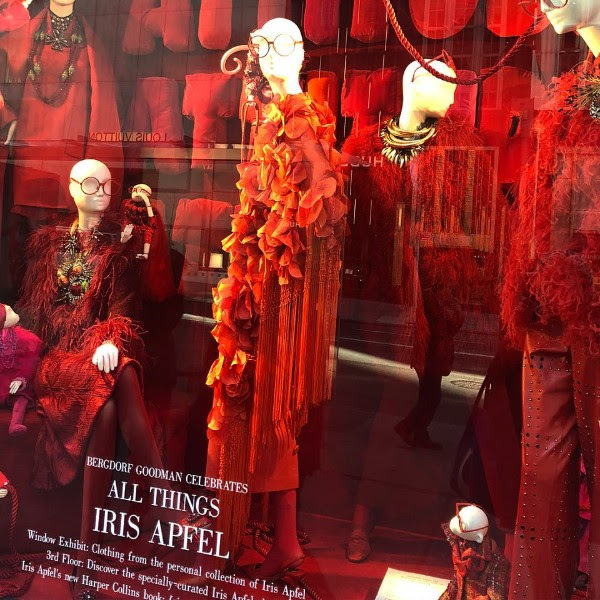 Bergdorf Goodman's windows and displays on the 3rd floor are dedicated to her book. The book and my recent visit to Bergdorf's inspired me to share some of her wit, wisdom, and sense of style with you. Take Risks, Try Some Color, and Invest in Accessories! What are the most important lessons Iris can teach us about style? 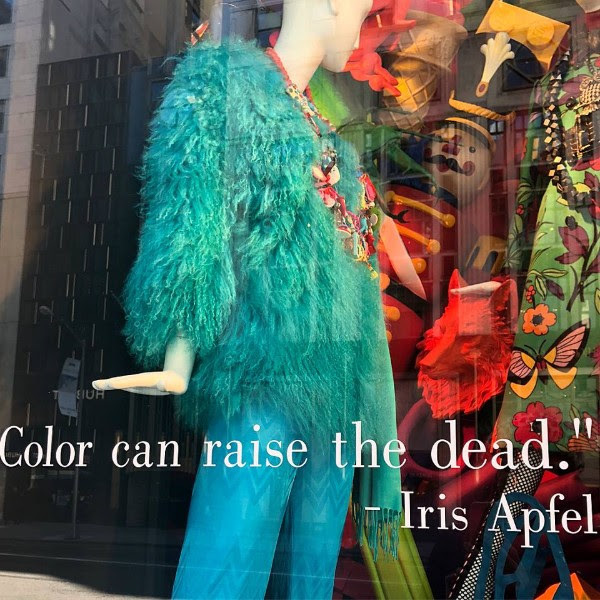 The 2 quotes below featured in Bergdorf's windows are a good place to start. First, don't be afraid to take risks. These don't have to be huge. Sometimes stepping outside your comfort zone just a bit goes a long way to making you feel more daring and confident. Rock a bold necklace if you always wear delicate ones or vice versa. This spring, bold yellow, lipstick red, and of course, Pantone color of the year, UltraViolet are the shades to choose. Think about the impact of a fire engine red raincoat or a pair of bright yellow sneakers, fresh! Finally, follow Iris Apfel's philosophy of accessorizing. Iris believes that "if you invest in a few well-made classic pieces in good fabrics - like a little black dress - and put your money into accessories, you'll have a million different outfits." How Can You Add A Little Iris To Your Own Style? Of course, not everyone is keen on wearing the weight of a small child in jewelry around her neck, but everyone should consider accessorizing with jewelry. At H*O*T, we believe accessories are just the spice you need to add flavor to your style. 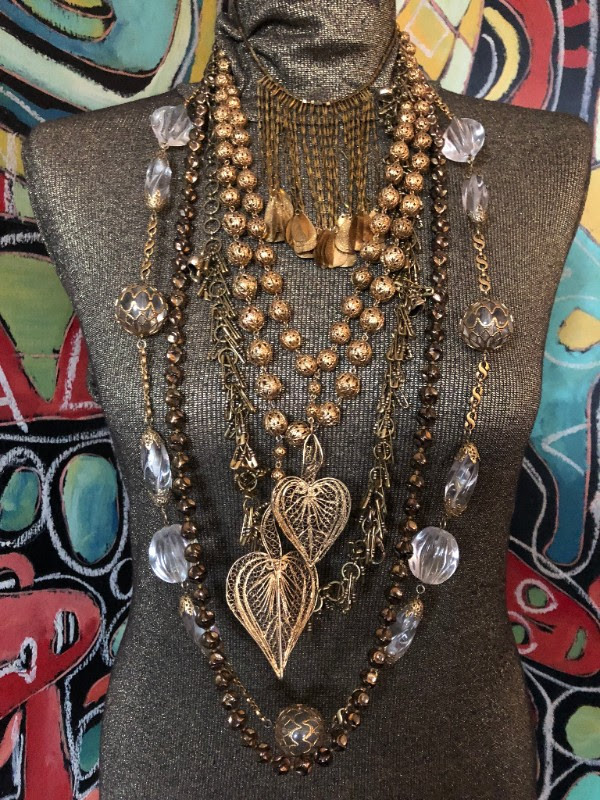 Why not start with just one of the necklaces we used to create these layered looks in pearls, brights, and gold which are inspired by the maximalist style of Iris. To help you get your Iris on and add just the spice you need to your outfits this Spring, we are giving you a 25% discount on all jewelry now through Easter! IT'S TIME TO CLEAN THAT CLOSET!